Gingerbread planet cookies, now with 100% more planet-forming disks. Still to log scale! Anise arrived to keep Saffron on her toes. Cheetahs cheetahs cheetahs cheetahs and some other stuff in Cape Town. Heidelberg, current record holder of the cold half of my largest 24 hour temperature swing: -5 F when I left, and 95 F when I got to Cape Town. Angela and Jake got married, and I wore a pretty dress. ... and camping on Bumpkin Island, which was like a combination of everything else I did this summer, except with fewer puffins. Spectacle Island and Boston Harbor, with Cristina and little Wedge. The epic solo observing trip to Australia and Chile, with 70 lbs of camera to lug between the two. Also, there were kangaroos and burros. 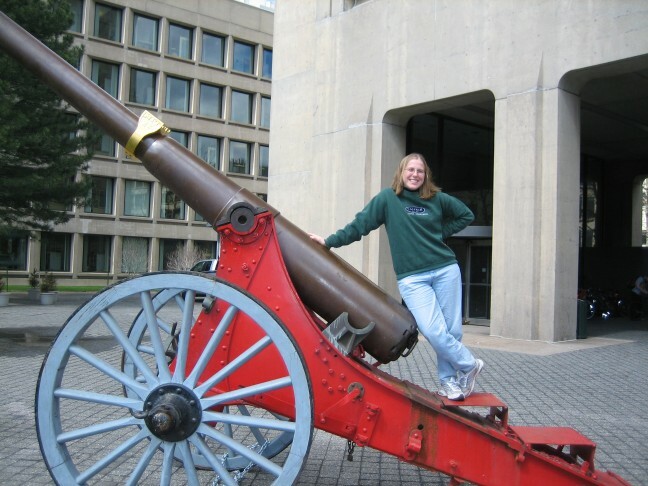 One day in May, I went in to work as usual, and there was the Fleming cannon. Costumes: currently featuring Halloween '03. Panther: some silly pix from the release night after we, um, waited in line for an hour for some dog tags. Er, cat tags. Highland: pictures of Jon's and my first apartment. From California to New Zealand: research cruise across the Pacific on the Nathaniel B. Palmer. San Francisco, Mar '02: spot the Apples. Ge 11a: geology field trip in central California. Santa Cruz Island: an island camping trip. England pictures: It's all about Muffin. Marley cat. Isn't he cute? Except for this, my very first digital image! 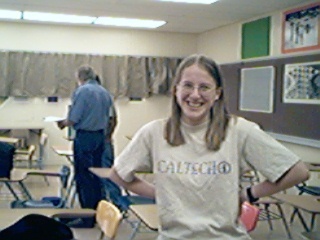 Taken of me in calculus class with one of them new-fangled "digital cameras" (courtesy of my friend Cristin, that early adopter). The hall passes of the world have suffered too long! Visit the Hall Pass Liberation Front for a photo essay on their pathetic plight. Note in 2012: site is still alive and kicking! Borrego: the desert, also April '99. Me at a costume party, August 14, 1998.